Sugar Creek Casino, Hinton OK (The Hollywood Times) 1/17/2018 – “Don’t live out your money.” Quote of Mickey Gilley. Urban Cowboy was a 1980 film starring John Travolta and Debra Winger. After moving to Pasadena, Texas, country boy Bud Davis (John Travolta) starts hanging around a bar called Gilley’s, where he falls in love with Sissy (Debra Winger), a cowgirl who believes the sexes are equal. They eventually marry, but their relationship is turbulent due to Bud’s traditional view of gender roles. Jealousy over his rival, Wes (Scott Glenn), leads to their separation, but Bud attempts to win Sissy back by triumphing at Gilley’s mechanical bull-riding competition. Gilley’s, owned by Mickey Gilley was a real Honky Tonk in Pasadena, Texas opened from 1971-1989 and was the first entertainment establishment with a mechanical bull to ride. After an article in Esquire Magazine the interest for Gilley’s to be the main location for the movie “Urban Cowboy” was determined. The Urban Cowboy Tour with two country music legends is well worth spending your time at any age. It has an honor for The Hollywood Times to be at the first concert the year at Sugar Creek Casino, Hinton, Oklahoma. The tour will be coming to Laughlin Nevada in April. So make it a point to get your tickets now and come out to support these two country legends on their Urban Cowboy Tour 2019! They will be performing at the Riverside Casino, so book your hotel and spend a few days on the Colorado river, eating, drinking and gambling a little. You might think because Mickey Gilley will be turning 83 this year he might not sound as good as when the iconic movie “Urban Cowboy” was released in 1980, but his voice is crystal clear. The only thing you might notice is he can’t play the keyboard anymore because of an accident affecting his spinal cord. His sense of humor really makes you feel comfortable on and off stage. Johnny Lee’s 1980 number one song for 3 weeks “Lookin for Love” is the song most of us relate to when we hear “Urban Cowboy.” Naturally that was the last song of the evening and the crowd was singing along and dancing in the aisles. I myself wore out my 8-track tape because I couldn’t get enough of all the fantastic music and spending my 21st birthday at Gilley’s are the main reasons I am a Country Fan today! “Stand by Me” and “Here comes the Hurt Again” were the two songs sung by Mr. Gilley in the film. Mickey’s favorite song in the film was “Look What You Done to Me” by Boss Skaggs. Most memorable moment was Jim Bridges, Director saying “More smoke, more smoke.” “We were filming during the day but needed to look like dark in the Honky Tonk,” said Gilley. Mickey loves reminiscing about growing up in small-town in Louisiana with his famous cousins Jerry Lee Lewis and Jimmy Swaggart. “I should have followed evangelist Jimmy Swaggart’s footsteps. God said to Jimmy all the money not needed in heaven, I will send to you on earth,” Gilley chuckled. “With his ministry he made more money than Jerry and I together.” J.D. Davis’s enthralling new biography Unconquered: The Saga of Cousins Jerry Lee Lewis, Jimmy Swaggart and Mickey Gilley is available online or after the concert for Mickey to sign. Being on set of “Urban Cowboy” Johnny rode the mechanical bull, but didn’t really elaborate on how long he stayed on! Being on the set singing his songs like “Cherokee Fiddle” and of course his first Gold record “Lookin’ for Love” was a highlight in his career. “I thank John Travolta every day”! Johnny Lee quote “Don’t hurt to look, doesn’t mean you have to order. Still looking for love”! The concert is a variety show. After working together for over 50 years Gilley and Lee have a friendship and stage chemistry that goes unmatched. When not touring the duo can be seen throughout the year in their hometown of Branson, Mo. At Mickey Gilley’s Shanghai Theater, Johnny enters the stage first talking with the crowd showing pictures of his daughter and grandson on the big screen. Singing from his new album “You Ain’t Never Been to Texas” some oldies” Yellow Rose”,” Hey Bartender” and “Cherokee Fiddle” from the move Urban Cowboy”. Gilley sings” Here Comes the Hurt Again” and talked about the thrill of his life singing with his hero Ray Charles. “You Don’t Know Me” was a classic recorded first by Ray 1962 and then by Mickey in 1981 for his album. The stage has many great musicians and 2 beautiful backup lady singers which help with the last set of Johnny and Mickey singing songs from the “Urban Cowboy” movie. Both sing “Mamas Don’t let Your Babies Grow Up to be Cowboys” a Waylon Jennings song. Look for 2019 tour dates coming to your town. A must see concert and you can meet these 2 legends, who stay after the concert to sign autographs and take pictures. They signed a picture of them together for P.A.I.N. Prevent Abuse in Neighborhoods (Country for a Cause). They even took a stroll into the casino to shake hands! Sugar Creek Casino opened in 2008 and has grown into one of the premiere entertainment destinations in Oklahoma. In 2012, Sugar Creek Casino opened a new 35,000 square feet Event Centers seating over 1,200 guest for a variety of award-winning musicians, comedians and sporting events. They are proud to announce that they have been voted the “2018 Oklahoma’s Readers’ Choice Winner Best Casino for Entertainment”! Sugar Creek Casino is an economic enterprise of the Wichita and Affiliated Tribes. Gilley’s was a bar/honky tonk founded in 1971 by country singer Mickey Gilley in Pasadena, Texas. It was the central location in the 1980 movie Urban Cowboy. It was a huge building with a corrugated steel roof that housed multiple bars and mechanical bulls. Connected to the club was a small rodeo arena that would also host both bicycle and motorcycle motocross races on Friday and Saturday nights. Sherwood Cryer was the co-owner of Gilley’s; he had many night clubs in Pasadena. Gilley’s ceased operations after a falling-out between Gilley and Cryer that ended in 1989 with the closing of the club. In 1990, a fire attributed to arson gutted the interior. The rodeo arena and some livestock stalls were the only structures still standing until 2006, when it was demolished by the Pasadena Independent School District, its current owner. Only the old sound recording studio remains, on Spencer Highway. On October 2, 2003, Gilley’s was reopened at a new location in Cedars, Dallas. The new club features a 26,000-square-foot (2,400 m2) main show room and the original mechanical bull, El Toro, featured in the movie Urban Cowboy. In total, the new club has 91,000 square feet (8,500 m2) of restaurant, entertainment, meeting, and private function space. Welcome to the Gilley’s store! Although the world famous honky-tonk is no longer, the Urban Cowboy legacy lives on through Gilley’s.com. At our store you can find most of Mickey’s music as well as some of the classic apparel made famous by the “Urban Cowboy” movie. There are also a few items we have left over from the club itself! Country music artist Mickey Gilley has been wowing fans with his haunting sound of Louisiana rhythm and blues since 1957. The Mississippi native grew up with his two famous cousins, Jerry Lee Lewis and Jimmy Swaggart, surrounded by the influence of music. Gilley made his chart topper debut with his song “Is It Wrong For Loving You,” in which Kenny Rogers played the guitar. After moving to Pasadena, Texas, in 1971, he opened his world famous honky-tonk nightclub, Gilley’s. He continued to show chart success with hits like “City Lights” and “Don’t The Girls All Get Prettier at Closing Time” both of which reached number one on the Billboard Country Charts. In 1980, Gilley appeared in the film “Urban Cowboy” alongside John Travolta and Johnny Lee. At age 82, Gilley is currently on the Urban Cowboy Reunion Tour with Johnny Lee, playing more than 40 dates across the United States in 2018. Keep up with Mickey on Facebook, Twitter, or visit his website at gilleys.com. Johnny Lee was born in Texas City, Texas, and is a member of the Texas Country Music Hall of Fame. In 1968, he began a 10-year working relationship with Mickey Gilley, at the World Famous Nightclub ‘Gilley’s’ in Pasadena, Texas. In 1979, Lee’s first screen role was in a TV Movie, ‘The Girls in the Office,’ starring Barbara Eden and Susan St. James. He was then asked to perform in the film, ‘Urban Cowboy,” starring John Travolta and Deborah Winger. “Lookin’ For Love,” was included on the movie’s soundtrack, and became Lee’s first Gold record. The song spent three weeks at #1 on the Billboard Country chart, and #2 on the Pop chart. It later became one of the Top 100 Best Country Songs of all Time. Johnny’s familiar songs include a string of Top 10 hits, such as “One In A Million,” “Bet Your Heart On Me,” “Cherokee Fiddle,” “Sounds Like Love,” “Hey Bartender,” “You Could’ve Heard a Heart Break,” and many more. When not traveling and performing, Johnny can be seen on many celebrity hunting and fishing shows, as well as on RFD TV’s “Larry’s Country Diner” & “Country’s Family Reunion”. 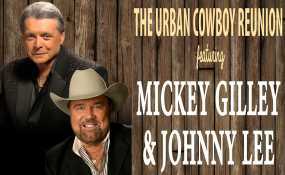 Currently Johnny can be seen performing solo and together with Mickey Gilley on the Urban Cowboy Reunion tour, playing more than 40 dates across the U.S. in 2019. For more information, visit thejohnnyleemusic.com. New episode featuring Steve Martin and Martin Short premieres tomorrow on Facebook Watch!